Since I was very happy with the results of baking Ken Forkish's 'Field Blend #2' from Flour Water Salt Yeast last time, I decided to make another loaf with the same Field Blend #2 recipe, with some alterations. This time, I added toasted unhulled sesame seeds (90g) into the dough like I did with Chad Robertson's Tartine Sesame Bread previously. 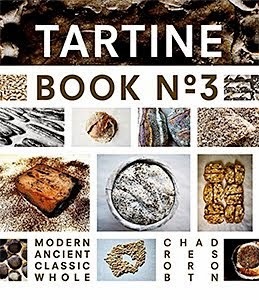 The reason why I was originally interested in Forkish's book was this post on The Fresh Loaf (by CeciC) about a sesame sourdough bread made with Robertson's Tartine Sesame Bread recipe, adopting Forkish's long bulk fermentation method in his Overnight Country Brown and a flour combination from Field Blend #2 recipes. 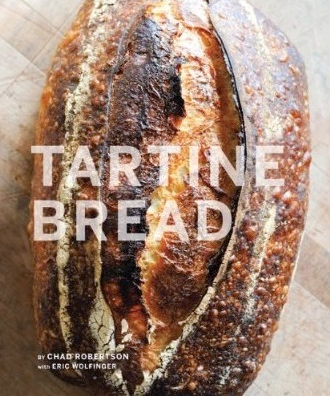 I have made sesame sourdough breads using Robertson's two different recipes before, one from Tartine Bread, one from Tartine Book No. 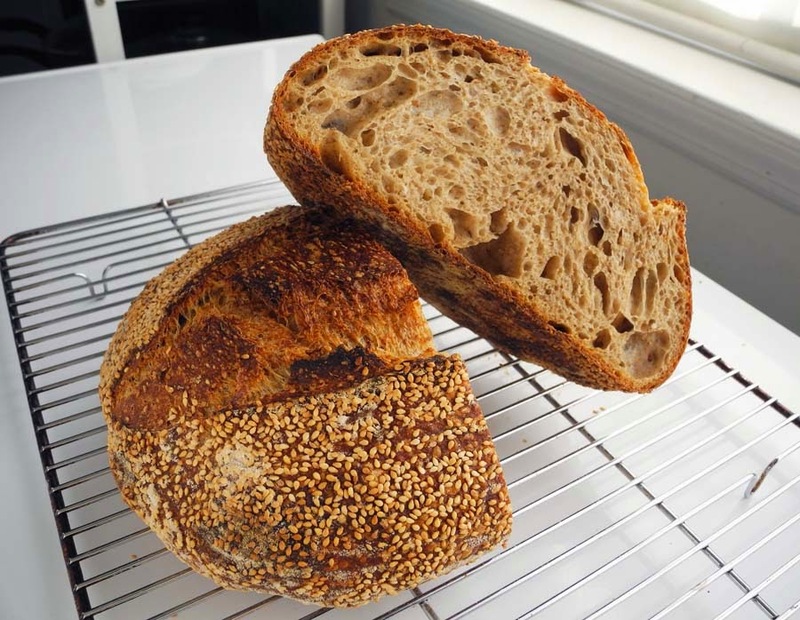 3, so I was curious about how different my sesame bread would turn out using Forkish's bulk fermentation methods. Another alternation was to leave out the instant yeast from the original recipe, since my previous loaf turned out great without instant yeast (which I simply forgot to add). But I am also curious about how it would affect if I add the instant yeast, so I may try that someday. 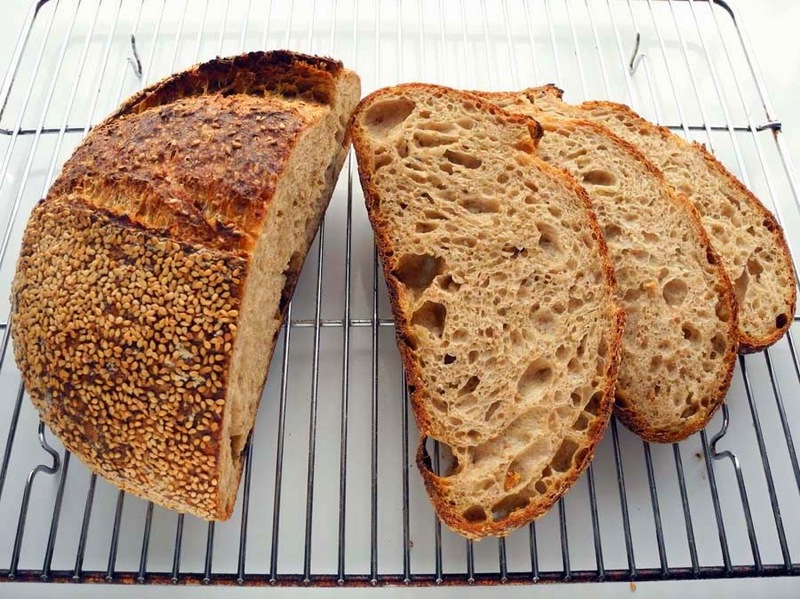 I also changed the ratio of flours to 17.5% whole wheat flour, 12.5% whole rye flour and 70% white flour, so the rye flavor would not conflict with the sesame flavor too much. 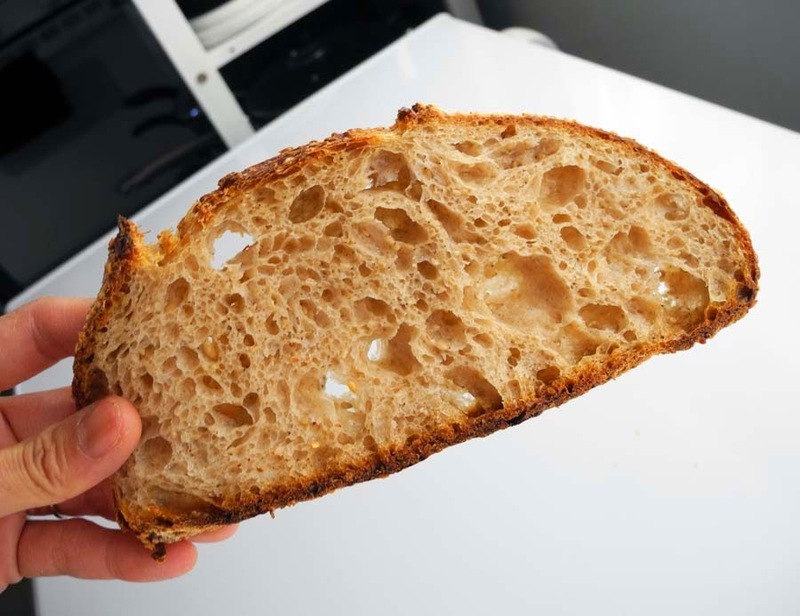 The flours I used for this bread were Community Grains 100% Hard Red Winter Flour, King Arthur Flour's Organic Pumpernickel Flour, KAF's All-Purpose Flour and KAF's Unbleached Bread Flour. Before starting to mix the dough, I roasted the unhulled sesame seeds on a pan for 20 minutes until the seeds' color turned darker and started to give out a nice toasted smell. Then I let them cool completely. It took a longer time for me to complete the final mix with the additional foldings for the sesame seeds to be thoroughly incorporated, so I decided to reduce 15 minutes from the 5-hour bulk fermentation time. 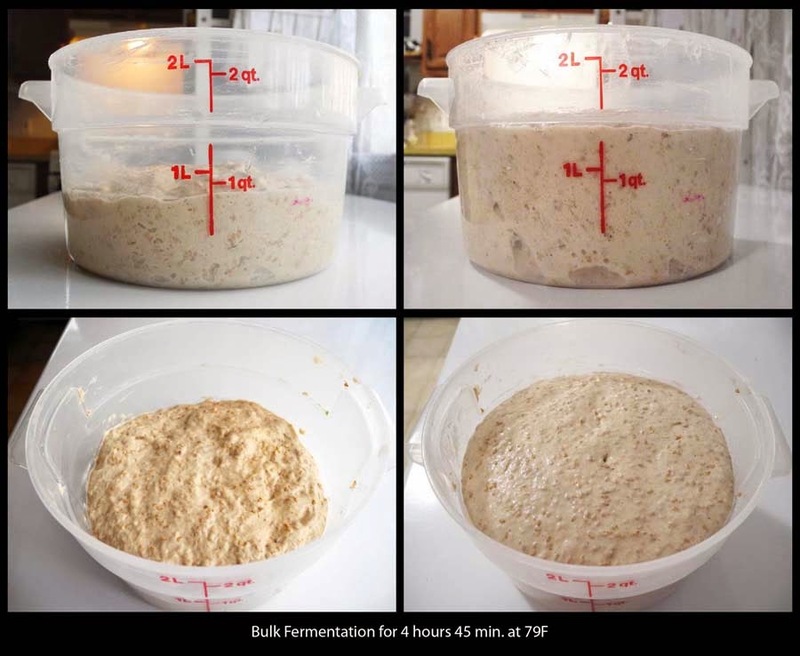 Bulk fermentation time was 4 hours 45 minutes at 79F until the dough rose to double. 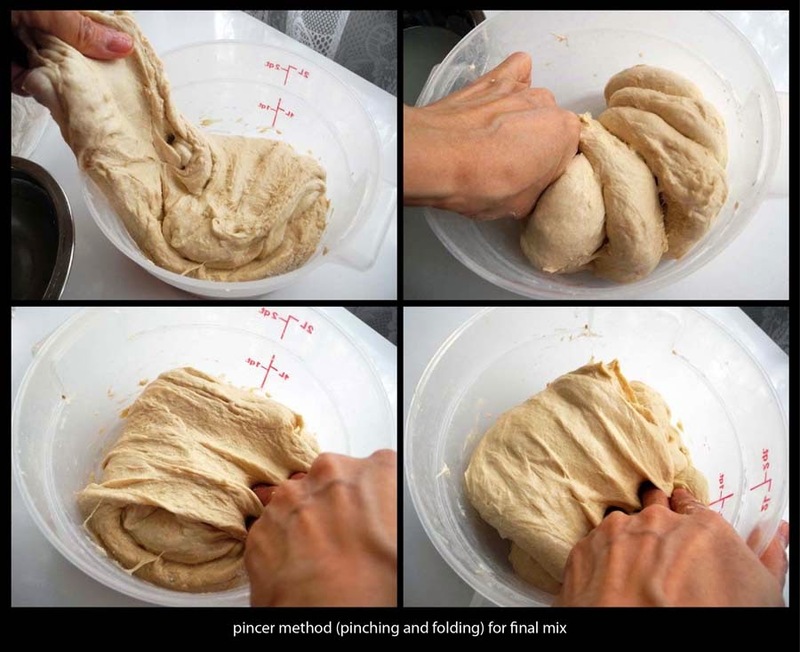 I gave the dough a series of 4 foldings 4 times each in the first 2 hours, and let the dough rest untouched for the remaining 2 hours 45 minutes. Then I preshaped the dough, and gave it 15 minutes bench rest. Next I shaped the dough and sprinkled hulled raw sesame seeds on the surface. 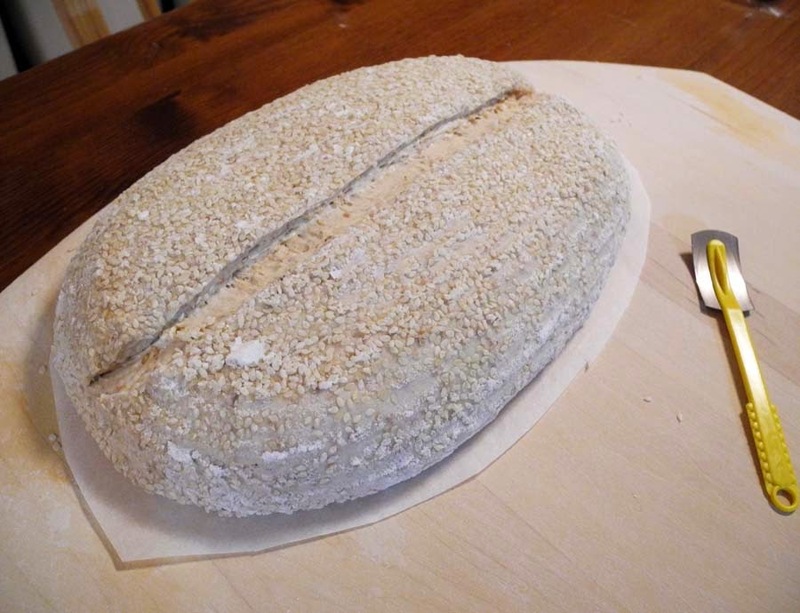 In order to make the seeds stick to the dough well, I patted the dough gently with a wet paper towel so the surface of the dough would be moist, and sprinkled the sesame seeds on top so they would stick to the dough evenly. For the final proof, I used an oblong basket this time instead of a round basket, to see how that affected the final shape. I dusted the inside of the basket well with a 50/50 mixture of rice flour and all-purpose flour, so the dough would not stick. Then I lifted the dough gently with my hands and placed it in an oval basket, with the seams side up this time, so I could score it later. I was originally planning to leave the dough in the refrigerator for 11-12 hours overnight, but when I checked the dough with a finger-dent test in the middle of the night, the dough seemed to be ready to bake after 7 hours, so I decided to bake it earlier (at 4:20AM). I preheated the oven at 475F for 45 minutes, with the Lodge combo cooker (Dutch Oven) set on a pizza stone in the middle of the shelf. 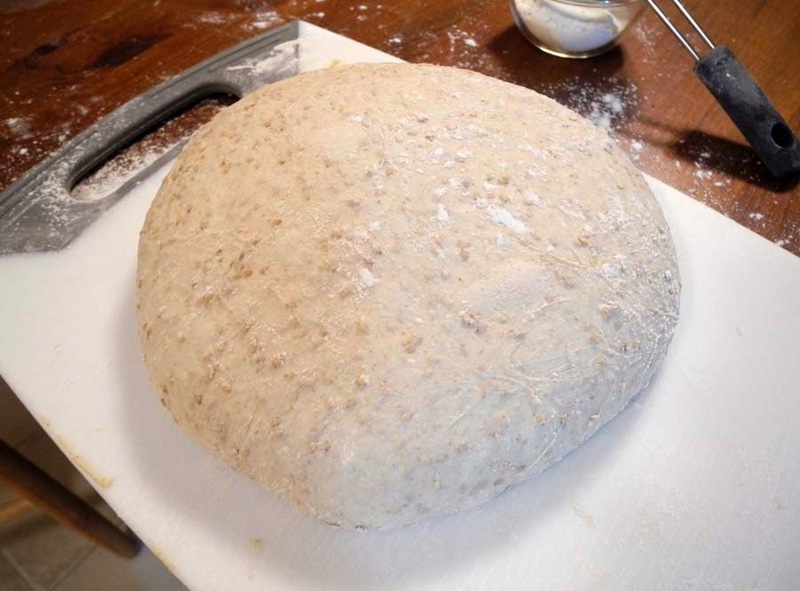 Scoring was easier when the dough was cold after retarding in the refrigerator for several hours. In order to place the dough in the pan perfectly, I put the dough on parchment paper set on a pizza peel first, cut off the extra paper around the dough, and slipped the dough onto a combo cooker's shallow pan. The dough which was proofed in a 10 inch oval basket just fit into the 3-qt Lodge combo cooker with no problem. I baked 30 minutes at 475F with the lid on, then 20 more minutes without the lid. The straight scoring from the end of the dough to the other end worked very well, resulting in a wide crack on top. It turned out to be a successful loaf with good oven spring again (thanks to the great recipe!) 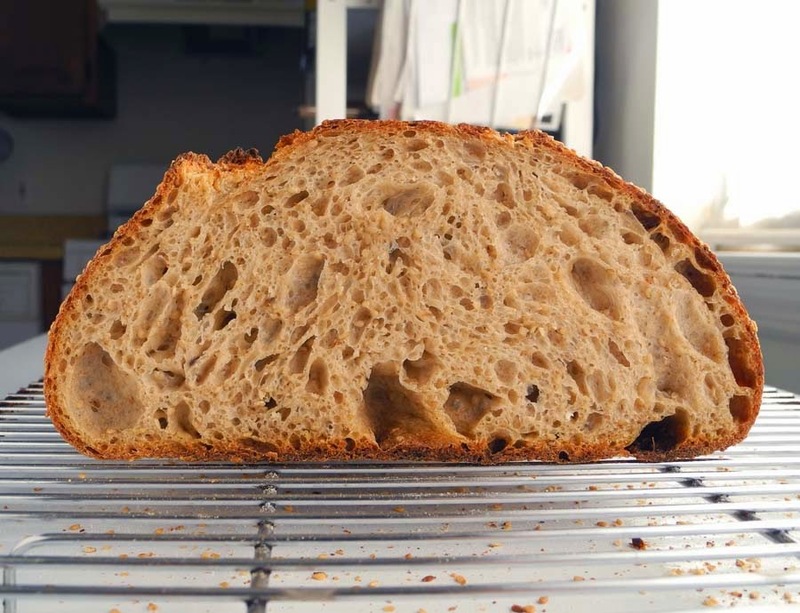 With Forkish's method, the loaf seems to have a bigger oven spring than the loaves I made with Robertson's Tartine country bread recipe previously. 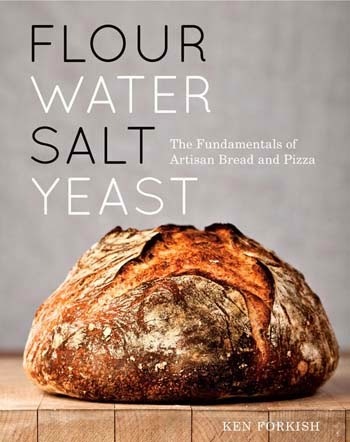 This might be because the dough that has risen to double during the long bulk fermentation gained more vigorous strength to rise in the oven afterward, while in Robertson's recipe, the dough is supposed to rise to only 20-30% during bulk fermentation. 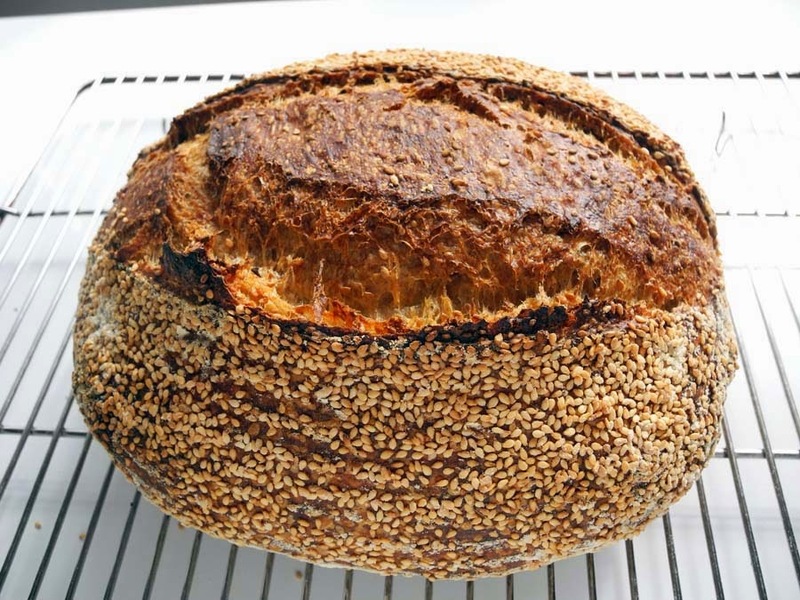 The toasted flavors of the loaf were amazing - it was not like just an aroma of roasted sesame seeds, but the complex flavors of three different flours and sesame seeds all melded into one. I love the dark chestnut color of the crust - this is one of the most fascinating features I learned from Forkish's book - "Bake until dark brown all around the loaf". 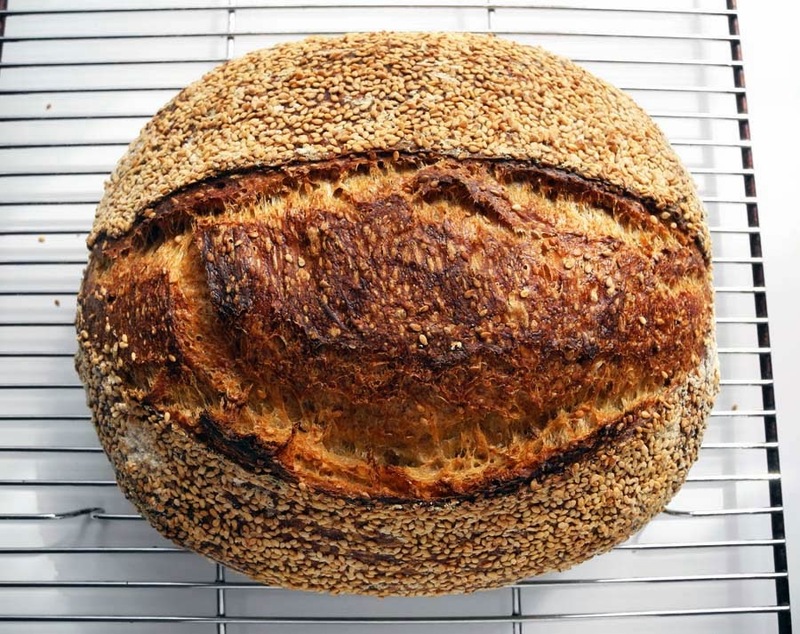 While the crust was thin and crispy, the inside crumb of the loaf was soft and slightly moist, with a mild sweetness and a nutty flavor of roasted sesame seeds. Although I added a lot of sesame seeds in the dough, the sesame taste and flavor were not too overwhelming. It tasted just great as it is without toasting. This loaf reminded me of the wonderful flavor of a sesame baguette from Breads Bakery near Union Square in NYC, which was perhaps the best sesame bread I had ever tasted. 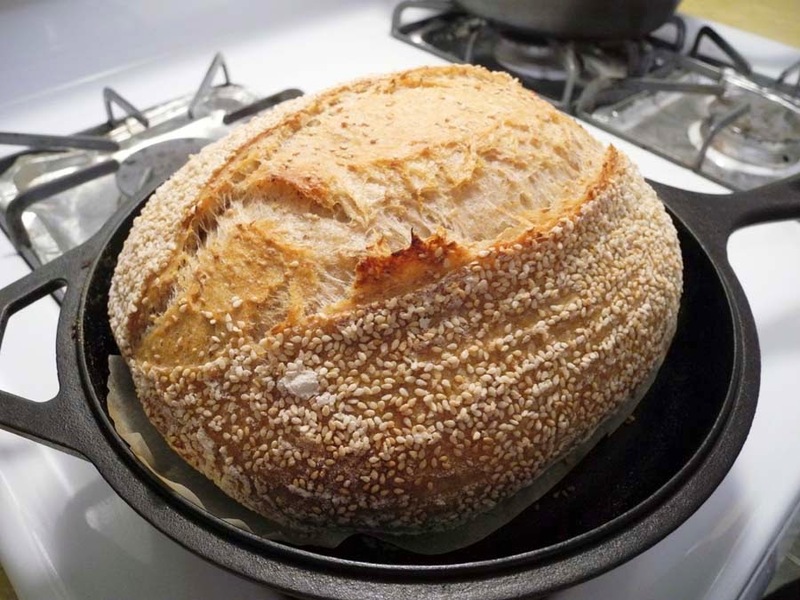 I am relatively new to sourdough bread baking and have enjoyed your blog both for encouragement and for information in my bread adventure. Just a quick thank you for taking the time to document, photograph and share your own experiences. Hope you're still baking beautiful breads!